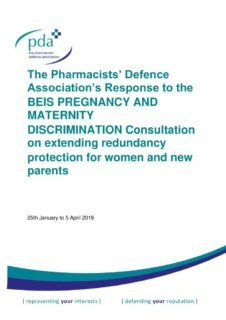 In 2016, BIS and EHRC published a report examining the prevalence and nature of pregnancy and maternity discrimination in the workplace. 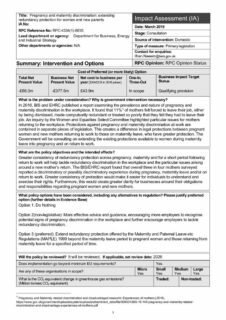 It found that 11% of mothers felt forced to leave their job, either by being dismissed, made compulsorily redundant or treated so poorly that they felt they had to leave their job (see the below impact assessment document). 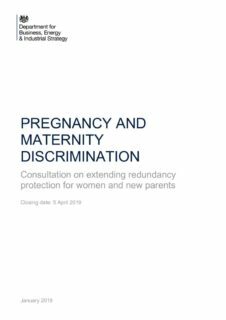 The report found that overall three in four mothers surveyed reported a discriminatory or possibly discriminatory experience during pregnancy, maternity leave and/or on return to work. Despite there being several pieces of legislation in place to provide protection against redundancy following pregnancy, there would appear to be evidence that some employers are either unaware of the regulations or choose to ignore them. Stronger legal protection, with greater penalties would go some way to act as a deterrent to the employers who flout the law. However, in granting any extension in the law it must be accessible and readily available to claimants.